Stainless steel, table top conveyor. Equipped with a 12" wide x 188" long Intralox belt powered by a ½ Hp drive, on/off switch, VFD and mounted on (6) leveling legs with an infeed / discharge range of 34" to 38". 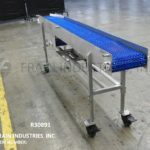 40" wide and 90" long, stainless steel, flat top Intralox belt conveyor has an infeed / discharge height of 38". Equipped with a ¾ Hp drive and mounted on (4) legs with leveling pads. Intralox, Model ARB. Activated Roller Belt conveyors enable accurate and reliable merging and aligning of products. Equipped with a 24" wide x 45" long flat top belt infeed conveyor, 24" wide x 57" long belt powered by 1 Hp motor drive. Activated rollers powered by product weight. 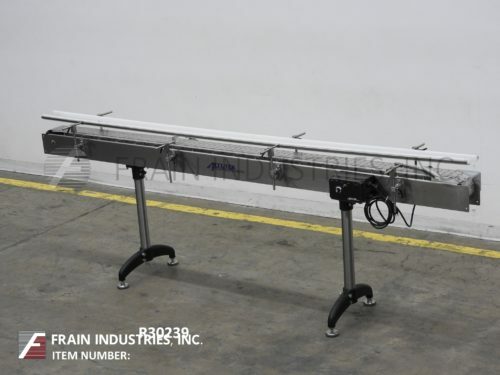 Conveyor has an in feed and discharge range of 28" to 34". Incoming packages are fed perpendicular to the conveyor. Angled rollers embedded in the belt surface gently rotate the package 90° and align products into a single lane along the length of the package. 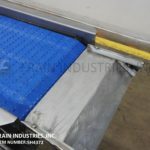 60" wide x 120" long stainless steel belt conveyor. (2) 30" wide and 120" long Intralox style belts have an infeed / discharge height of 35". Equipped with a 1½ Hp drive and mounted on (6) legs. Smalley model Storveyor, storage conveyor. 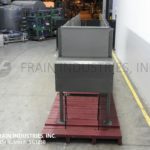 Equipped with 238" long x 31" wide Intralox belt with 49" discharge height, 31" high stainless steel product containment walls, (6) 6" wide x 36" long product access ports with hinged covers, photo eye at product discharge. Mounted on painted steel frame with 38" high legs. 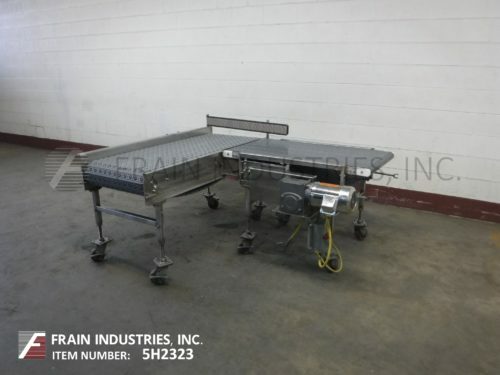 Accutek, 4½" wide x 120" long, stainless steel table top conveyor. 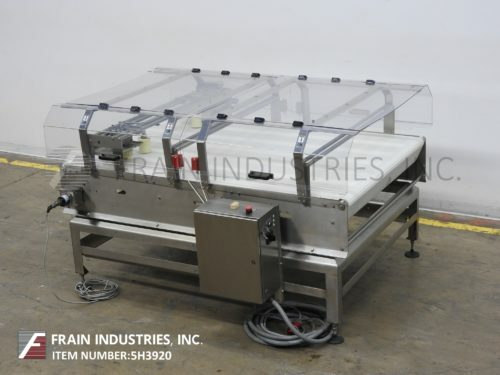 Equipped with a 4½" wide x 120" long stainless steel belt with and infeed / discharge height range of 32" to 36" and mounted on a (4) leg frame with variable speed control.